I was playing a lot with radare2 in the past year, ever since I began participating in CTFs and got dAnalyze alleeper into RE and exploitation challenges. I found radare2 very helpful with many CTFs tasks and my solutions had shortened significantly. It’s sometimes also my go-to tool for malware analysis tasks such as configuration retrievals. Sadly, I believe that only few people are familiar with radare2. It might be because they’re afraid to break out of their comfort zone (IDA Pro, OllyDBG, gdb) or they have simply not heard of it. Either way, I honestly believe that you must include radare2 in your toolbox. Because I got really enthusiastic about the project and I want more and more researchers to be familiar with it, use it and hopefully contribute to the project, I decided to create a series of articles and use-cases of r2. Since these articles aim to teach you the basics of radare2, its features and capabilities, I’ll explain much more than you actually need to know in order to solve each task. 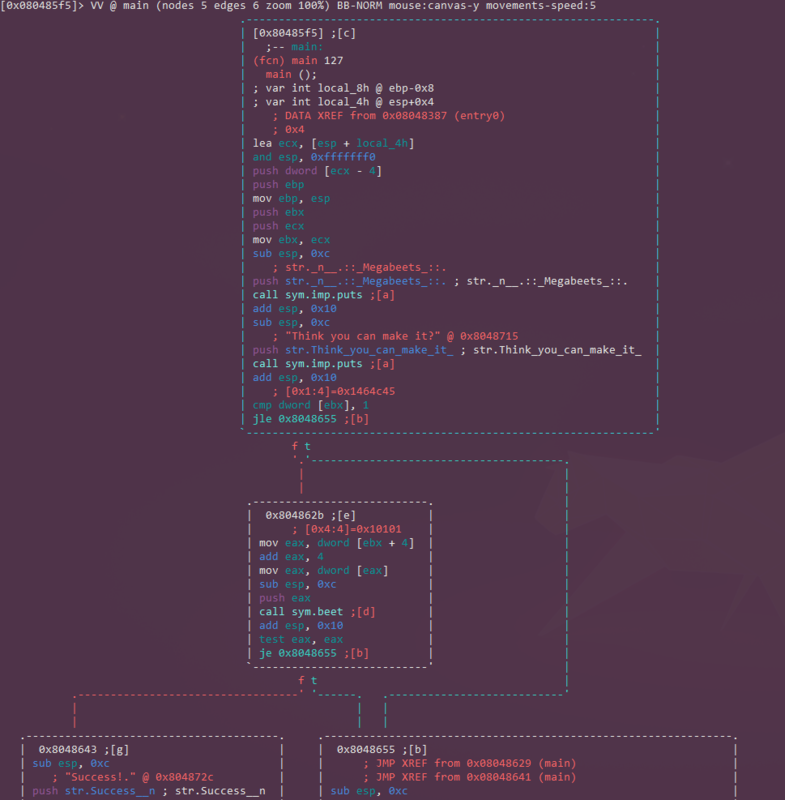 radare2 is an open source framework for reverse engineering and binaries analysis which implements a rich command line interface for disassembling, analyzing data, patching binaries, comparing data, searching, replacing, visualizing and more. It has great scripting capabilities, it runs on all major platforms (GNU/Linux, .Windows *BSD, iOS, OSX, Solaris…) and it supports tons of architectures and file formats. But maybe above all of its features stands the ideology – radare2 is absolutely libre. This framework is composed of a set of utilities that can be used either together from r2 shell or independently – We’ll get familiar with tools such as rahash2, rabin2, ragg2. Together they create one of the most powerful tools in the field of static and dynamic analysis, hex editing and exploitation (I’ll dive deeper in the following articles). It is important to note that r2’s learning curve is pretty steep – although r2 have a GUI and a WebUI, none of them is quite enough to compete with the GUI or the convenience of IDA, IMHO. 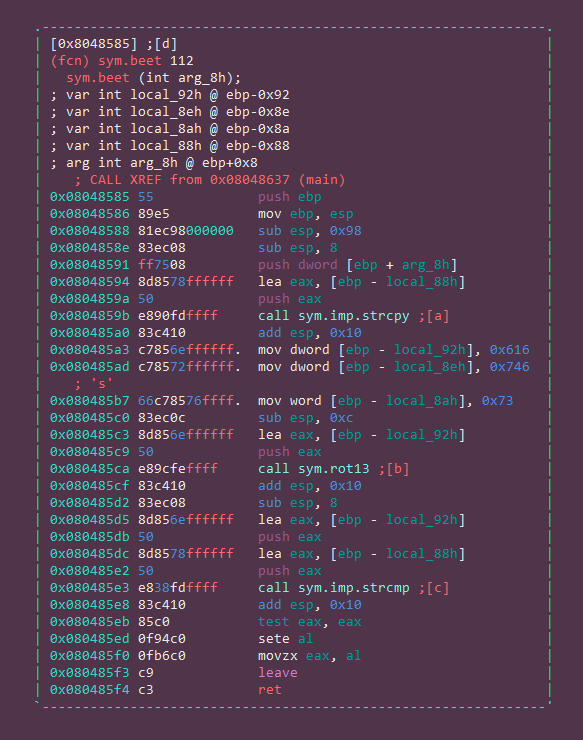 The CLI, however, including its Visual Mode, is still the core of radare2 and where its power lays. Because of its complexity I’ll try to make things as clear and simple as I can. 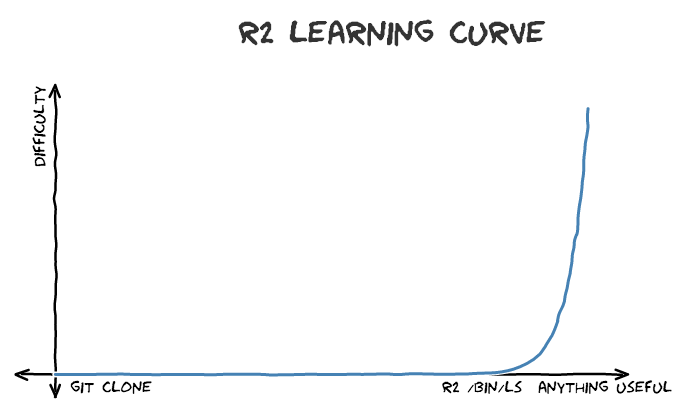 This is more or less how r2 learning curve works. Before we begin you can check out the “Unfair comparison between r2, IDA Pro and Hopper” to get an idea of what we’re dealing with. Finally published the first part in a series of articles: A journey into radare2. Radare2’s development is pretty quick – the project evolves every day, therefore it’s recommended to use the current git version over the stable one. Sometimes the stable version is less stable than the current git version! If you don’t want to install the git version or you want the binaries for another machine (Windows, OS X, iOS, etc) check out the download page at the radare2 website. And you’ll have the latest version from git. I usually update my version of radare2 in the morning, while watching cat videos. You can download the first challenge here. Now that radare2 is installed on your system and you have downloaded the binary, we are ready to start exploring the basic usage of radare2. I’ll work on a Remnux machine but most of the commands and explanations (if not all of them) would be the same for Windows machines and others. As most command line utilities, the best approach to reveal the list of the possible arguments is to execute the program with the -h flag. Whenever I face a new challenge I first want to get information about the binary. Let’s extract it using one of the most powerful tools in r2 framework: rabin2. rabin2 allows extracting information from binary files including Sections, Headers, Imports, Strings, Entrypoints, etc. It can then export the output in several formats. rabin2 is able to understand many file formats such as ELF, PE, Mach-O, Java CLASS. Check man rabin2 for more information. We’ll call rabin2 with the -I flag which prints binary info such as operating system, language, endianness, architecture, mitigations (canary, pic, nx) and more. As you can clearly see, our binary is a 32bit ELF file, not stripped and dynamically linked. It doesn’t have exploit mitigation techniques – a useful information for the next articles when we’ll learn to exploit using radare2. Now let’s run it and see what the program does. Note: Although I promise you can trust me with running this crackme, it’s highly recommended not to trust me. Whenever you reverse an unknown binary, please do it inside a virtual environment where nothing can be harmed. $ ./megabeets_0x1 . :: Megabeets ::. Think you can make it? Nop, Wrong argument. $ ./megabeets_0x1 abcdef . :: Megabeets ::. Think you can make it? Nop, Wrong argument. The first time we run it we receive a message saying “Nop, Wrong argument”. Assuming we need to provide an argument for the program we run it again, this time with ‘abcdef’ as an argument. We failed again. Obviously some password is needed in order to solve this crackme. — Thank you for using radare2. Have a nice night! We used the ie command that prints the entrypoints of the binary. r2 commands are a succession of meaningful letters. In this example ie stands for info >> entrypoint. Hence the commands are easy to remember once you’re familiar with radare2 capabilities. But you don’t have to remember all commands – you can simply add ? after (almost) every letter to get information about the command and its subcommands. The i command aim to get information from the opened file, it’s actually rabin2 (mentioned earlier) implemented in radare2 shell. radare2 doesn’t analyze the file by default because analysis is a complex process that can take a long time, especially when dealing with large files. To read more about analysis and the choice not to perform analysis at startup you can read this post at radare2 blog. Obviously analysis is still a possiblity and r2 has lots of analysis types. As I noted before, we can explore the analysis options by adding '?‘ to 'a' command. I usually begin with executing 'aa' (analyse all). The name is misleading because there is a lot more to analyze (check aa? but it’s enough for most of the binaries I examined. This time we’ll start straight with aaa to make things simpler and due to its small size. You can also run radare2 with the -A flag to analyze the binary straight at startup using aaa (e.g r2 -A megabeets_0x1). [*] Use -AA or aaaa to perform additional experimental analysis. After the analysis radare2 associates names to interesting offsets in the file such as Sections, Function, Symbols, Strings, etc. Those names are called ‘flags’. Flags can be grouped into ‘flag spaces’. A flag space is a namespace for flags of similar characteristics or type. To list the flag spaces run 'fs'. We can choose a flag space using 'fs <flagspace>' and print the flags it contains using 'f'. To pass several commands in a single line we can use a semicolon (i.e 'cmd1; cmd2; cmd3;...'). We see that r2 flagged up some offsets as strings, some sort of variable names. Now let’s have a look at the strings themselves. There are several ways to list the strings of the file, and you should choose the one suits your goal the most. vaddr=0x08048700 paddr=0x00000700 ordinal=000 sz=21 len=20 section=.rodata type=ascii string=\n . :: Megabeets ::. vaddr=0x08048715 paddr=0x00000715 ordinal=001 sz=23 len=22 section=.rodata type=ascii string=Think you can make it? We already know most of these strings – we saw them when we executed our binary, remember? We didn’t see the “Success” string though, this is probably our ‘good boy’ message. Now that we got the strings, let’s see where they’re used in the program. This command reveals us more of radare2 features. The 'axt' command is used to “find data/code references to this address” (see 'ax?'). '@@' is like foreach iterator sign, used to repeat a command over a list of offsets (see '@@? '), and 'str. *' is a wildcard for all the flags that start with 'str.'. This combination helps me not just to list the strings flags but also to list the function name, where it’s used and the referenced instruction. Make sure to select the strings flagspace (default, use 'fs *') before. As I mentioned before, all this time we were at the entrypoint of the program, now it’s time to move on. The strings we just listed are all referenced by ‘main’. in order to navigate from offset to offset we need to use the ‘seek’ command, represented by 's'. As you already know, appending ? to (almost) every command is the answer to all you problems. So basically the seek command accepts an address or math expression as an argument. The expression can be math operations, flag, or memory access operations. We want to seek to the main function, we can do it by executing 's main' but let’s see first what other functions radare2 flagged for us using the afl command (Analyze Functions List). Sweet! There are the imports we saw before, some .ctors, the entrypoints, libc, main and two interesting functions named ‘sym.beet’ and ‘sym.rot13;’. It’s time to look at some assembly (yay!). We first need to seek to the function using s main and then disassemble it using pdf (Print Disassemble Function). Pay attention how the address at the prompt changed to the address of main. Note: As I said before, the goal of this tutorial is to teach radare2 and present some of it’s capabilities, not to teach assembly. Therefore I will not go through the code deeply and explain what it does. Honestly, the binary is really simple, you should get it even with basic understanding of reverse engineering. | 0x08048609 6800870408 push str._n__.::_Megabeets_::. ; str._n__.::_Megabeets_::. radare2 is equipped with a very strong and efficient suite of Visual Modes. The Visual Mode is much more user-friendly and takes the reversing using r2 to a whole new level. Pressing V will bring us to the Visual Mode screen. Use p/P to change between modes. At the top of the screen you can see the command which was used to generate the view. Navigate to the disassembly view using p.
You can go up and down using k and j respectively. Pressing Enter whenever you’re on jump or call will take you to the destination address. Next to each jump and call there’s a number inside square brackets, pressing the number on your keyboard will take you to the function/address. As always in radare, pressing ? will take you to the help screen, you can explore the commands of the Visual Mode. Use x/X to list the references to/from the function respectively. Use the numbers to jump to a reference. Use :command to execute r2 commands from inside Visual Mode. You can add or remove comment using ;[-]comment. m<key> can be used to mark specific offset with a key of your choice. Press '<key> to go to your key. Press q to return to r2 shell. As in similar disassemblers, radare2 has Graph view. You can access Visual Graph mode from your shell by running VV, move Left/Down/Up/Right using h/j/k/l and jump to a function using g and the key shown next to the jump call (e.g gd). Use ? to list all the commands and make sure not to miss the R command. Seek to beet in r2 shell and print the function by using s sym.beet (sym.beet is a flag for the beet function. You can print the ‘sym’ flags by running f sym.<tab> ) and then executing pdf (print disassembled function). Print beet from r2 shell without seeking by using pdf @ sym.beet . @ is used as a temporary seeking. i.e “print the function at offset sym.beet”. Jump to beet from Visual Mode from main using 3 (the digit next to the jump call). Jump to beet from Visual Graph Mode from main using gd (‘d’ is the letter next to the jump call). We can see that the given argument is copied to a buffer. The buffer is located at ebp - local_88h. ‘local_88h’ is actually 0x88 which is 136 in decimal. We can see this by executing ? 0x88. To execute r2 command from inside Visual Graph mode use : and then write the command. Hence, 128 bytes are allocated for the buffer in the stack, the next 4 bytes would be the saved ebp pointer of the previous stack frame, and the next 4 bytes will be the return address, this sums up to 136. After the buffer is filled with the given argument, it is then compared with the result of a function named sym.rot13. Rot-13 is a famous substitution cipher used a lot in CTFs and Crackmes. The function is called with 9 hexdecimal values that seems like radare failed to recognize as a string. We can do it manually using ahi s on these addresess. Great! Looks like the string that was hiding is “Megabeets” (pushed in reversed order due to endianness). The binary performs rot13 on “Megabeets” and then compares the result with the argument we passed it using strcmp. Luckily we don’t need to work hard because r2 framework already include rot13 cipher in its rahash2 utility. rahash2 compute checksums of files or strings using various algorithms. Check man rahash2 for more information. 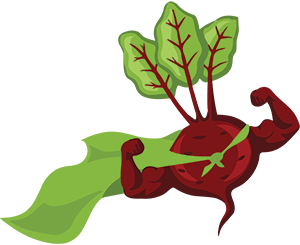 rahash2 performed rot13(“Megabeets”) and resulted with “Zrtnorrgf”. By using ! we can execute shell commands from within r2 shell as in system(3). We can assume that “Zrtnorrgf” is compared with our input. 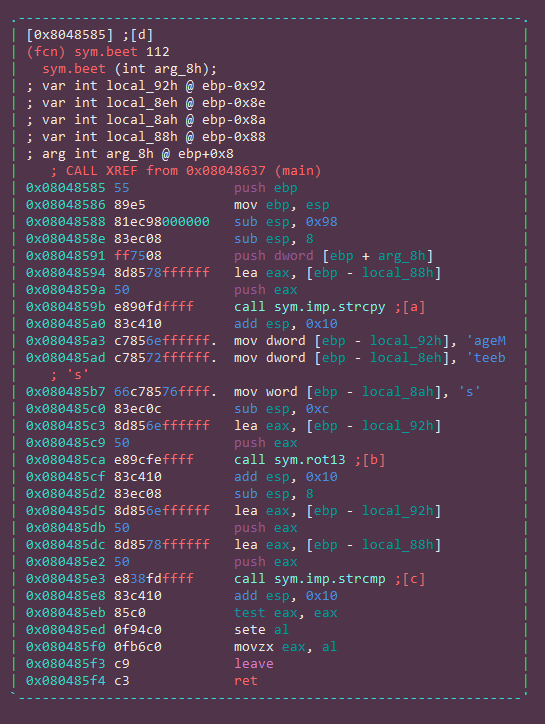 Let’s open the binary in debug mode with “Zrtnorrgf” as an argument using ood (check ood?) and see what we’ll get. Selecting and continuing: 7575.:: Megabeets ::. Woohoo! We received the success message and solved the crack me. After getting the success message we can finally say that what the binary is doing is to take the first argument we pass it and compare it with rot13(“Megabeets”) which is “Zrtnorrgf”. You can see the full source-code of the crackme here. Here the first part of our journey with radare2 is coming to an end. We learned about radare2 just in a nutshell and explored only the basics of the basics. In the next parts we’ll learn more about radare2 capabilities including scripting, malware analysis and exploitation. I’m aware that it’s hard, at first, to understand the power within radare2 or why should you put aside some of your old habits and get used working with radare2, but I promise that having radare2 in your toolbox is a very smart step whether you’re a reverse engineer, a CTF player or just security enthusiast. Above all I want to thank Pancake, the man behind radare2, for creating this amazing tool as libre and open, and to the amazing friends in the radare2 community that devote their time to help, improve and promote the framework. Please post comments or message me privately if something is wrong, not accurate, needs further explanation or you simply don’t get it. Don’t hesitate to share your thoughts with me. Subscribe on the left if you want to get the next articles straight in your inbox. Outstanding tutorial! As a beginner to RE and r2 in general this was extremely well written and easy to follow. Am looking forward to more entries in this series! The best ever seen tutorial. Thanks for this gem ! I was always wondering how to see actual strings stored in the memory addresses before they are passed to some function or compared against something. This is great, I love it! This is really quite excellent–looking forward to the next installment! Hope to get your help，think you! Did you analyzed the binary using aaa? If so, it should work. space – to toggle between visual mode and graph mode. And please paste the full r2 -v result. What machine do you work on? If still nothing works, we’ll open an issue on github. think you, i am success to go into Visual Graphs as your method. now ,i am try to use r2 analysis go language program, Is there some recommendation article? thank you ,have a nice day! I followed along the tutorial for learning r2. I had a question on making r2 to recognize specific offset as a string. I ran the same command. But it did not work. The graph did not get refreshed. 4. Press r to refresh the graph. Hey illnino, it should work. you can also try it from outside Visual Mode and then execute pdf to see if it changed. 4. Press d to define the selected line, then i to set immediate base, type s and press enter. The line should change right after it. 5. Use j again to move to the next line and repeat step 4, and then again on the next line. I have forget to chmod 755 the megabeets_0x1 file before to execute it on debug mode 🙂 first. It crashes. Thanks! There’s a minor typo where you call rahash2, the string should be ‘Megabeets’ (no trailing new line). Thanks for the feedback Peter! I wrote it intentionally since there’s a bug while executing it without \n. For some reason, everything works fine up until the very end, when you type “ood Zrtnorrgf”. It seems to be having permissions issues. I saw the comment about chmod 755 and tried that but my megabeets_0x1 file already had the same permissions (tried chmod 755 anyway just to be safe), I also tried chmod 777. Here’s the error I’m getting. r_core_file_reopen: Cannot reopen file: dbg:///home/Pragmata/Documents/ReverseEngineering/Crackmes & CTFs/Megabeets0x1/megabeets_0x1 Zrtnorrgf with perms 0x0007, attempting to open read-only. Interesting, it works for me just fine on the latest version. Please make sure to update radare to its newest version if you haven’t did yet. Seems like a bug, I’d suggest you to change the location of megabeets_0x1, say to /tmp/megabeets_0x1. Maybe the & sign is causing an issues. Anyway, ood is used to “reopen the file in debug mode”, you can do this by yourself by simply execute r2 -d megabeets_0x1 Zrtnorrgf. Hey thanks! Both solutions worked, and then I went ahead and tried removing the & sign from the directory name (just “Crackmes” is equally as descriptive, heh..) and it solved the issue entirely! This article is gold, can’t wait to read part 2, and hope to see parts 3 and 4 soon. 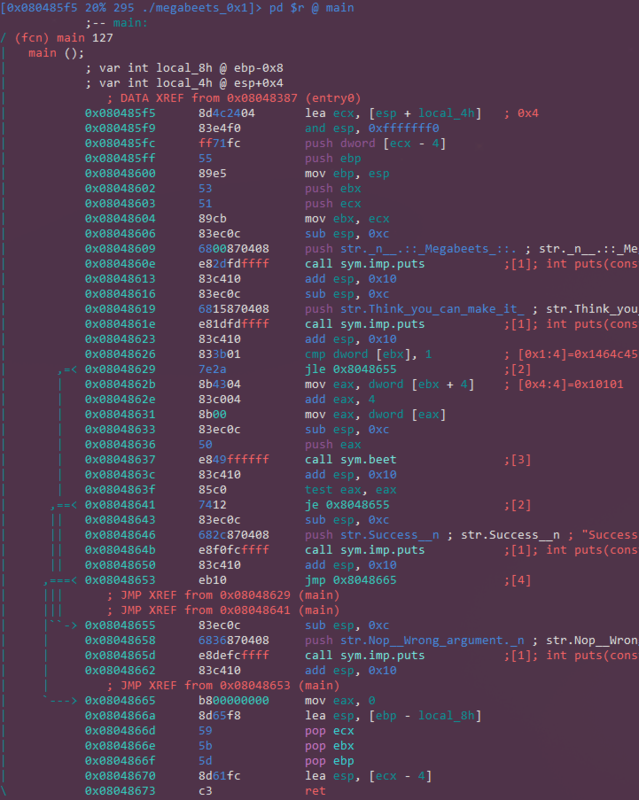 I’m new to reverse engineering in general as well as radare2, I’m still learning assembly and olly/ida, yet you made everything clear and easy to understand. Many thanks! The reason is the “space” in file path . It works fine after I change the path from “dbg:///home/remnux/A-journey-into-Radare2/Part 1 – Simple crackme/megabeets_0x1” to “dbg:///home/remnux/A-journey-into-Radare2/Part1/megabeets_0x1” . Thanks for this introduction. It is a very good job. Thank you so much! You’re welcome! Thanks for the tutorial. Do more lessons and if possible video. How to stop(breakpoint) the program in a certain place? 2) db main # or db sym.main, db sym.beet, db sym.rot13, ….. The program ends, but does not stop. Saw this in the video, I try to repeat and it does not work out. Tried it in different programs. This actually should work, you can try with the address (db 0x40...). Updated to the new version (2.9.0) and it all worked. It’s hard to read on my monitor because of the sidebar on the left. It’s wasting a lot of space. Also, it’s irritating to keep scrolling code/console parts of your tutorial horizontally left and right all the time. Zooming out completely makes it small. Can you pls fix this? Thanks for the feedback Anutrix! How small is your monitor? Can you please PM me on some IM app (Telegram, twitter,…)? I really like the colors in your r2. Are you using a custom color scheme and would you mind sharing it? To be honest, the post is way too old and I changed computers and terminals since then.